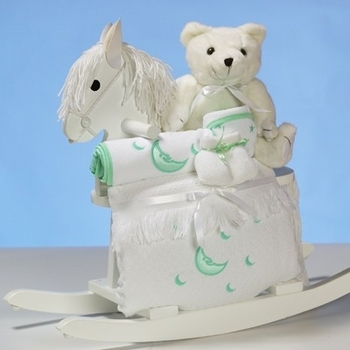 This unique baby present is designed with beautiful green accents making this an ideal choice for a boy or girl. It features a solid wood painted rocking horse and coordinated unisex layette items to complete this adorable ensemble! You also have the option to have add the baby�s name to the 100% cotton bib in beautiful embroidery for an extra personalized detail! This entire ensemble arrives fully gift wrapped in opaque tulle for an impressive gift presentation! Click on More Images above to see a picture showing a bib that has been personalized with the embroidered name.